Following on from our first look at the i9 7900X, we’ve now had a chance to take a look over a few more interesting chips from this enthusiast class range refresh. We have before us today two more chips with the first being the i7 7800X which is the replacement for the older 6800K, once more offering us 6 physical cores with hyper-threading giving us a total of 12 logical cores to play with. It’s running a 3.5GHz base clock and features an all core turbo of 4GHz although being the 6 core it offers us the most potential to overclock we’ve seen within this range. The second chip we have here is the 7820X and on paper it looks to be the most interesting one for me on this generation due to its price to performance ratio. Replacing the 6900K from the previous generation but coming in for around £350 less, this chip offers 2 more cores and a higher all core turbo rating along with a 1/3rd more cache than the 7800X edition. For reference the current price at time of writing for the 7800X is £359 and the 7820X currently retails for £530. I’m not going to go too much into the platform itself this time around, I gave some background to the changes made on this generation including possible strengths and flaws back in the i9 7900K first look over here. If you haven’t already checked that out and wish to bring yourself up to speed, now is the time to do so before we go any further. Everyone up to speed? Then let us begin. The first question I had from the off was one of how are these going to handle given the heat we saw with the 10 core? The quick answer is surprisingly well compared to the earlier testing we carried out. The retail releases I’ve been playing around with here are allowing us to drop the voltages on them to almost half the level that we expected to see with the previous generation and certainly a few notches lower than we saw in the earlier testing we carried out. So whilst I did hope for some marked improvements on the final release I didn’t quite expect to see it quite so quickly, normally these sorts of improvements take a few months of manufacturing refinement to appear and its great we’re seeing this right now. It certainly gives me some confidence that we’ll be seeing improvements across the range over the coming batches and I’m now far more confident that the larger i9’s that they have already announced should hold up well when they do finally arrive with us in the future. If I was to give a rough outline of the state of these Skylakes i7’s I’d say they are still running maybe 10% hotter than the last generation Broadwell-E clock for clock. However Intel has these designed to throttle at 105 degrees, essentially giving it 10% more overhead to play with so they do seem to be confident in these solutions running that much hotter in use over the longer term. One thing I noted in testing was that we were seeing a lot of micro-fluctuations across the cores when load testing. By that I mean we’d see temperatures bouncing up and down by anything up to 6 or 7 degrees as we tested, but never on more than a core or two at the time and it would be pulled straight back down again moments later only for another core to fluctuate and so on. Behind this is Intels new PCU (Package Control Unit) that has been added to Skylake X series, and whilst I did note the ability to turn it off inside of the BIOS by doing so we’d also see some additional rise in the temperatures with it disabled. One of the strengths of the PCU and these new P-States appears to be the ability to load manage well and it actively aims to offer the smoothest experience as far as power saving goes. It’s certainly welcome as it does seem to offer more control over the allocation of system performance and doesn’t appear to be causing the same sort of C-State issues we saw when that first appeared so this looks to be another welcome feature addition at this time. Once again we’re seeing the same sort of 99% CPU load efficiency across the board as we saw when testing in Cubase on the 7900X. This I suspect is in no small part down to the board and CPU trying their hardest to strike that power to performance balance I mention above and is great to see. 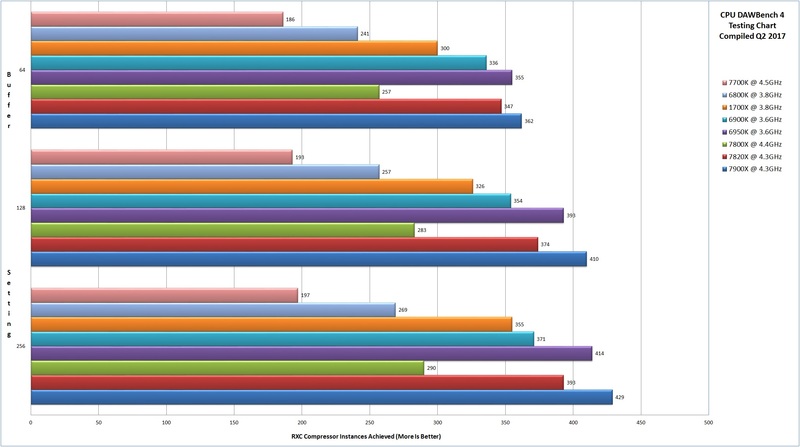 On to the figures then and first up the standard synthetics in the shape of Geekbench 4 and the CPU-Z benchmark. The obvious comparison here it to line it up against the previous generations 6 core solution. 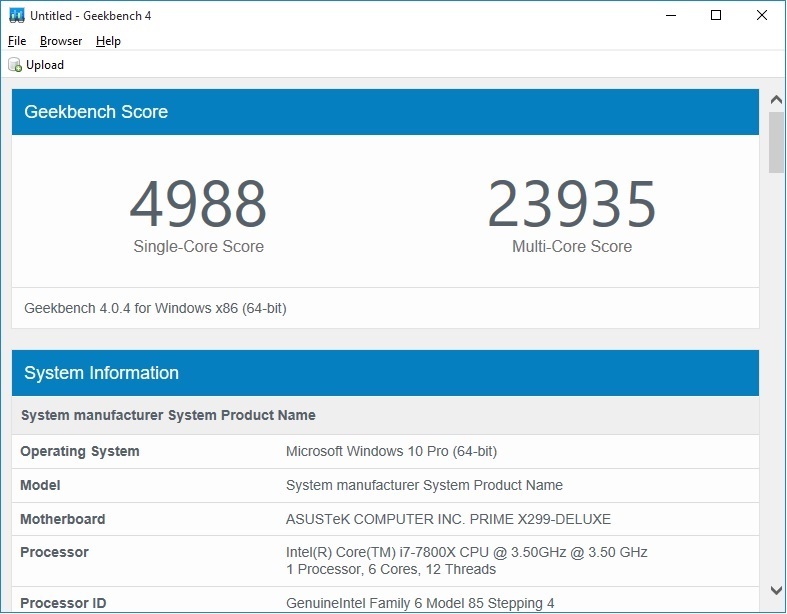 The 6800K saw Geekbench single core scores in the region of 4400 and multi core scores around the 20500 mark, meaning that these results are sitting in the 10% – 15% increase range which is pretty much where we expect a new generation to be. 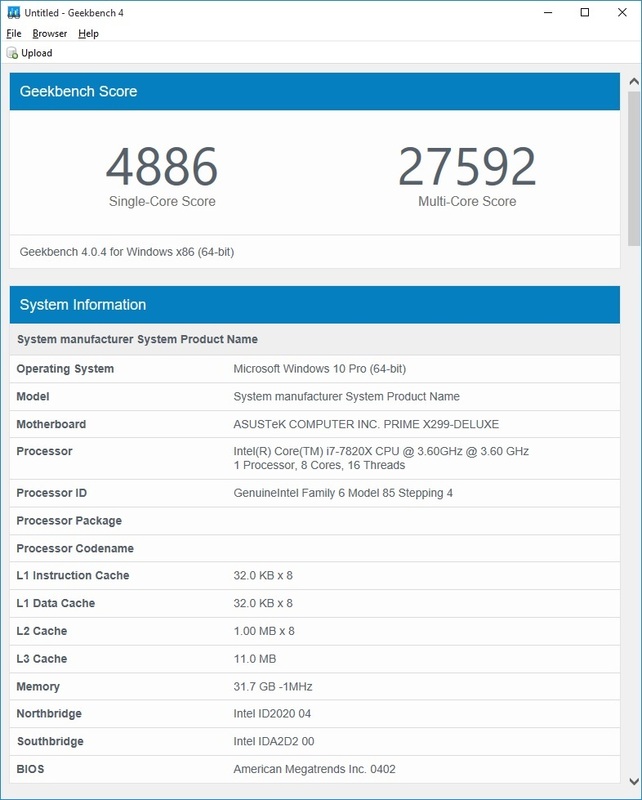 In a similar fashion we can take a look at the last generation 6900K which had a Geekbench score in the 4200 range and the multi-core was sitting around the 25000 level. Once again we’re looking at around a 10% gain in these synthetics, which is pretty much in line with what we’d expect. So far, so expected and to be honest the isn’t any real surprises to be had here as we start with the DAWBench DSP test. With the 7800X can see small gains over the previous 6800K chip which is just short of the 10% mark so even perhaps just a little lower than we would have expected. 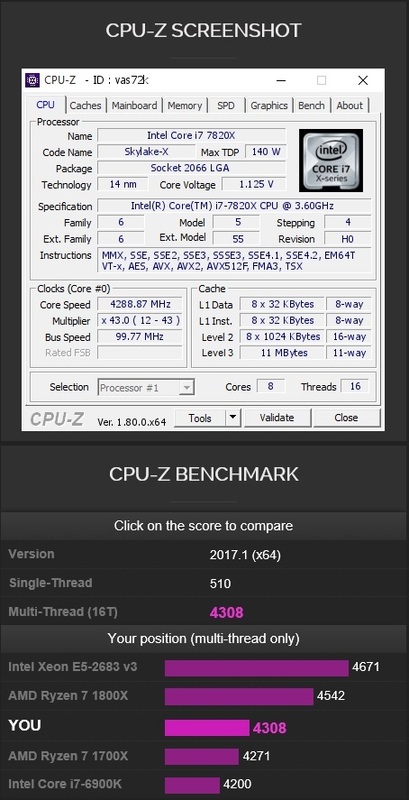 In fact in this test the 7820X offers similar modest gains over the older 6900K model and doesn’t do much to surprise here us here either. The DAWbench VI test tells a similar story at the lowest buffer setting with the 7800X and 7820X both sitting roughly where we expect. What proves to be the one point of interest beyond this however is that both chips scale better than their previous iterations once you move up to the larger buffer sizes. 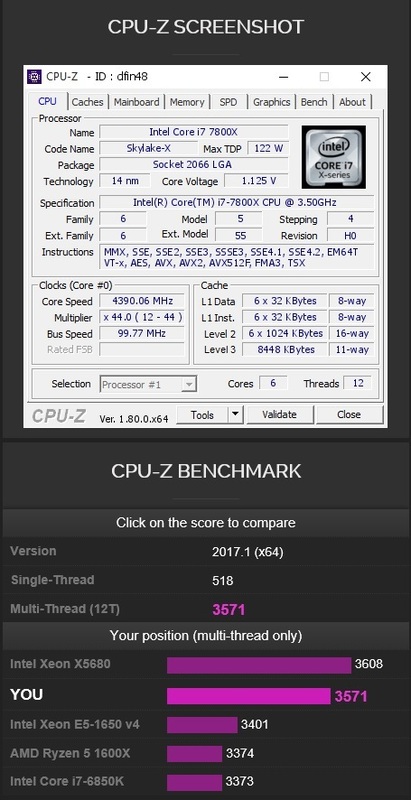 Whilst testing these chips much like the high-end 7900K, we saw them managing to hit CPU loads around the 99% mark, but you can see that each chip scaled upwards with better results overall when compared not only with their previous edition but also when placed up against the chip above them in the previous range. We saw a similar pattern with the Ryzen chips too and their infinity fabric design is similar in practice mesh design found in the Skylake X CPU’s. The point of these newer mesh style designs are to improve data transference within the CPU and allow for improved performance scalability, so with both firms looking to be moving firmly in this direction we can expect to see further optimizations from software developers in the future that should continue to benefit both platforms moving forward. Looking towards the future and the are already plenty of rumours already circulating regarding the expectation of a “Coffee Lake” refresh coming next. This includes a new mid-range flagship that is shaping up to offer us a contender against the 7800X and might prove to be an interesting option for anyone looking for a new system around that level, but doesn’t currently find themselves needing to pick up a new system right away. Also we’re expecting Threadripper to arrive with us over the next few months which is no doubt the comparison that a lot of people will be waiting on. It’ll be interesting to see if the scaling characteristics that were first exhibited by Ryzen get translated across to this newer platform. The entry level enthusiast chips have long proven to be the sweet spot for those seeking the best returns on the performance to value curve when considering Intel CPU’s. This time around however whilst the 7800X is a solid chip in its own right, it’s looking like the the extra money for the 7820X could well offer a stronger bang per buck option for those looking to invest in a system around this level. Previous PostIntel i9 7900X First LookNext PostFuzzy, Overdriven Distortion! The best of all worlds……. ?